“It’s quite interesting; it’s not beautiful,” Fran Evans of Hamburg said about his voodoo lily, an unusual plant from Cambodia. Last year Evans showed us his many gardens that were filled with early spring flowers. At the same time, his six-year-old voodoo lily (Amorphophallus konjac), a potted specimen, bloomed for the first time. 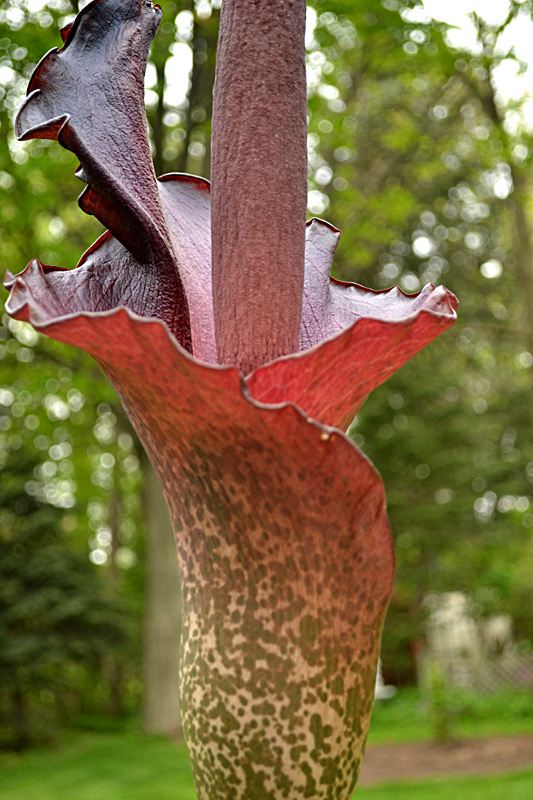 The blossom has a cool pitcher shape, decorated in regal colors of maroon and gold. I’d say the voodoo lily was pretty– if it weren’t for the smell. Now, I’m not talking about the scent of a flower like the marigold that some people love and others don’t care for. The voodoo lily has a decidedly unpleasant aroma. What does it smell like? One summer I threw some raw chicken skin into my kitchen trash can and forgot about it. Several days later I flipped the lid open and got a whiff. That’s what the voodoo lily smells like. It’s not a terribly strong smell, especially when the plant is outside, but it’s definitely stinky. The flies are attracted to the plant’s smell, which apparently is what the plant wants. Evans’ plant budded at the beginning of May in his screened-in porch. The plant doesn’t like frost, but he scooted the pot onto his patio anyway because the smell was too nasty for the plant to remain indoors. Fortunately, the plant survived and thrived. Everything about the voodoo lily is big. Evans’ plant was as tall as I am. The corm (bulb) was larger than a softball and weighed about four pounds. 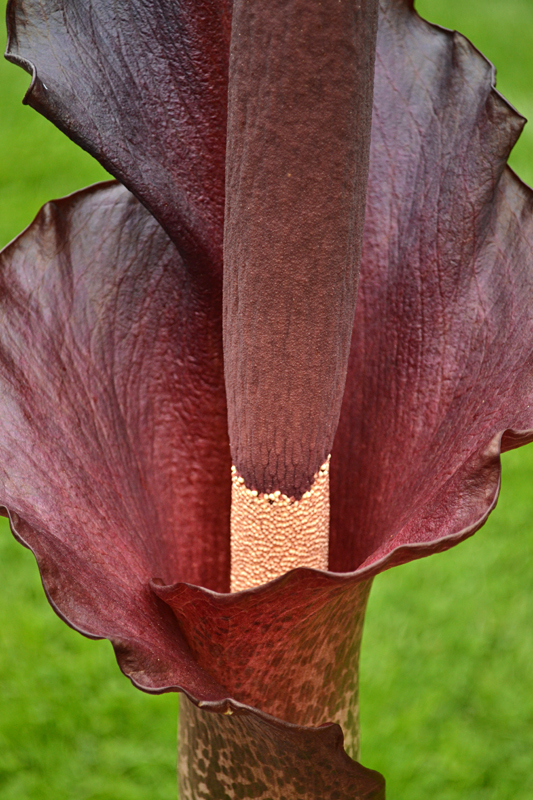 What’s amazing to me about the voodoo lily is not just the size of the plant, but the relative size of the flower. The blossom accounts for half the size of the plant. Evans got the bulb from his son. The bulb was already three years old when he got it, then Evans grew the bulb himself for about three years. In the fall of 2011, he placed the bare bulb in a paper bag. He placed the bag in a root cellar in his basement and stored it over the winter. The temperature was between 35 and 45 degrees Fahrenheit. When the bulb started sprouting in March, he planted it in a pot. It finally bloomed in May 2012. Over the past summer, he kept the plant outside and watered it well. In the fall, he brought the bulb inside again. It may or may not bloom again this year, Evans said. Evans has several voodoo lily plants, and he is trying a little experiment this winter. He’s leaving one of the biggest bulbs in its pot over the winter instead of unpotting it and storing it in a paper bag. When the bulbs begin to wake up in March, he’ll fertilize the bulb that’s already in a pot. The bulb that’s in a paper bag will be planted in a pot. He’ll see which one does better. “I just hope they don’t grow so fast that they open in the house,” Evans said. Is this plant a voodoo lily, too? Barb Krajewski emailed me these photos of a plant that showed up in her garden. It looks to her like it might be a voodoo lily. I don’t know what this plant is. Can any of you identify this plant? Please leave a comment below. Oh my gosh! I’m pretty sure I had one of these growing in my flower bed and had no idea what it was or where it came from! I took pictures and was going to ask Ken Brown or Cooperative Extension what the heck it was (but never did). Not sure if it’s still here because I may have ripped it out…we’ll see when spring/summer comes! I wish I could attach my picture! 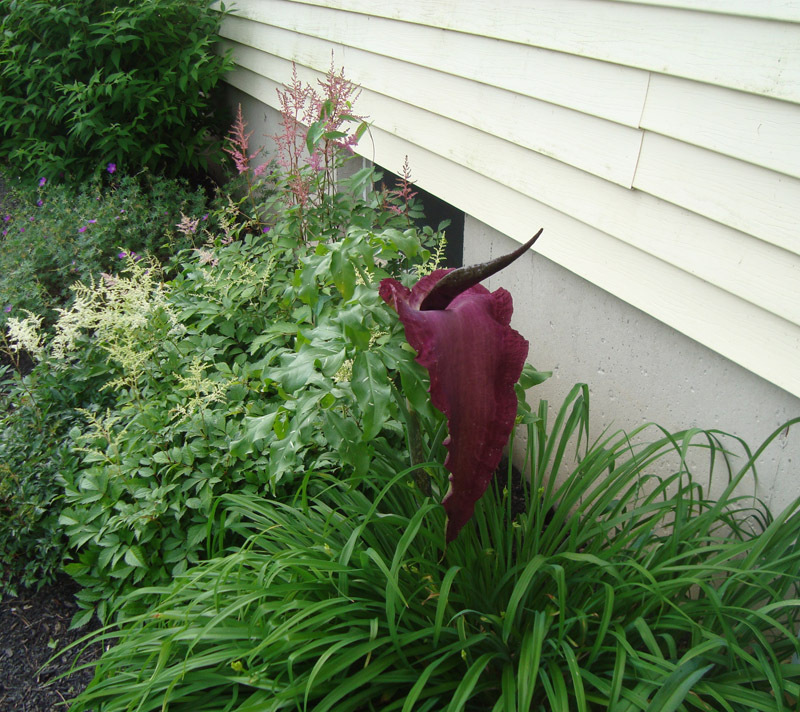 Have had a voodoo lily growing in my Amherst garden for more than six years. After 3 years, a smaller one appeared in a flower bed on the otherside of my yard. It has never been lifted out for the winter, grows in the ground not a pot. Email the photo to me at connie@buffalo-niagaragardening.com. I’ll be able to insert the photo at the end of the article so we can all see it. Wow! If you got a voodoo lily showing up in a spot that is some distance away from your original plant, that could explain how Barb got one to “volunteer” in her garden. Has your voodoo lily bloomed? The first has bloomed every year for over 6 years. The one across the yard has been blooming for about three years. A pretty amazing plant. It is quite a beauty, but I have smelled one in bloom before and it is putrid. Very cool! How is the smell? Also, can you identify the plant in the photo that I just posted at the end of the article? Is that a voodoo lily, too? I just thought to ask– How does your plant smell? 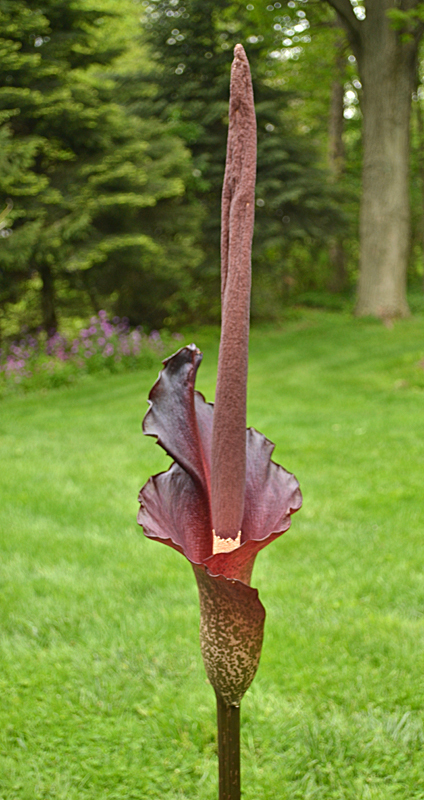 If it doesn’t smell like garbage, it’s probably not a voodoo lily? It was fun seeing a voodoo lily, but I’m not sure I’m adventurous enough to have one in my yard. On the Facebook page for Buffalo-NiagaraGardening.com, Ricky Rico pointed me to this post on Rural Ramblings. I think Barb’s plant looks just like the one in that post. I live in Kenora, Ontario, Canada and I bought one of these amazingly beautiful plants at one of our local nurseries last spring. I grew it in a pot on my deck over the summer and dug up the bulbs in the fall after the foliage had died off. Stored the bulbs in a paper bag over the winter and just planted them in pots in my house around a week ago. The largest of the bulbs has already produced a flower (yes, in my house) and it opened this morning. It is stinky for sure..but beautiful!! My dogs are sniffing it and barking at it..hahaha. Wish I could take it outside but it is still too cold here. It is an awesome plant though..and very easy to grow!! How exciting that your voodoo lily bloomed! We had an early spring when I visited Fran Evans, so he was able to set his outside. The voodoo lily is a very dramatic looking plant, but I would definitely prefer the scent of hyacinths in the house! Thanks for writing. I just picked up one of these at the Hamburg farmers market last weekend. I dont think iI realized what iI was in for. The man who sold it to me said that it was 2 years away from blooming. I have it potted in my Window and it has already started to leaf. Pretty excited to see how it’s going to turn out. Will it only grow as big as the pot that you have it planted in or do they get huge no matter what? My voodoos have been in full bloom this week, when not raining, it has been a joy to sit and watch them – maybe from a distance (smell) but so beautiful and exotic compared with my cultivated garden. By next week no smell, but no flowers – but maybe some more babies to surprise me. Nick, Fran says you should repot it every year in a larger pot. If you try to keep it in a small pot, he says it will break the pot– he had that happen in a plastic pot. If you have more questions, you can see him at the market. I happened to come across this web site while searching for something else. I read the article & viewed the pictures and feel the need to speak. I know Fran Evans and I also gave him Amorphophallus konjac that you see flowering and I gave him tubers around 3/4 years ago at the Armor VFC craft show. I als gave him Sauromatum venosum (not pictured). 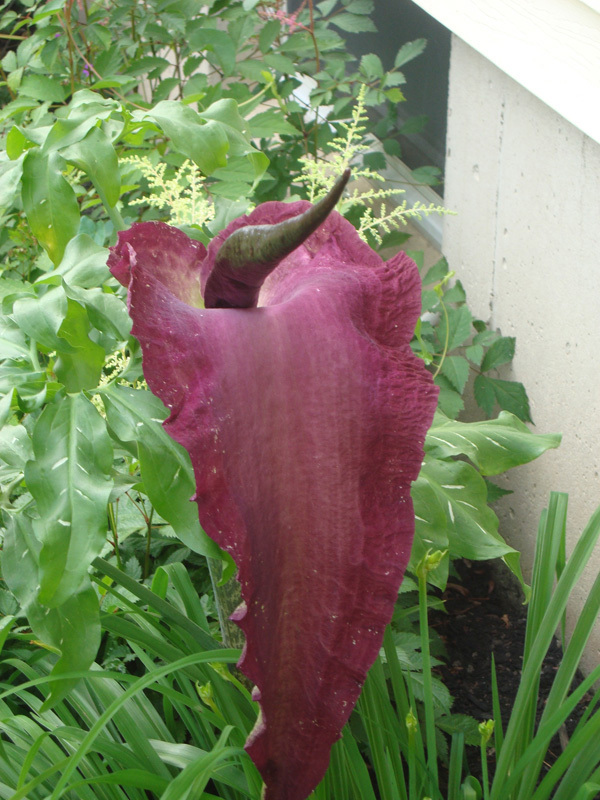 The “voodoo lily” pictured growing outside is a Dracunculus vulgaris. I grow this along with Sauromatum venosum outside. I also have grown Amorphophallus konjac outside along a east facing wall – it has not bloomed outside. Gerry, thanks so much for that information on the “voodoo lily” plant. I am on Facebook and have a Page called: Olmz’s Garden and I will be ptting up pictures and information on the so called “Voodoo Lilies” that I grow – if you are on Facebook feel free to look up and “like” my gardening Page. Gerry, I have liked your Facebook page. You can find Buffalo-NiagaraGardening.com on Facebook, too. Also, did you know it’s free to subscribe to Buffalo-NiagaraGardening.com? It’s free to subscribe, and when you subscribe, the newest issue is emailed to you every Tuesday. 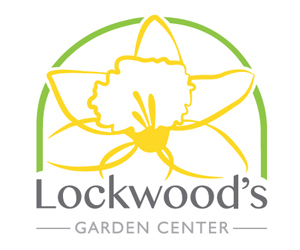 Please tell your gardening friends! I have had a Voodoo Lily for around 6 plus years, & was surprised when just a week ago I found a flower developing! It is almost out now! Amazing flower, smells like something died a week or two ago. I too have noticed small tubers in the garden around it, can’t work that out because mine is in an earthenware pot. Beth, Wow! Those usually plants usually bloom in spring. I have heard a lot of people comment that with this mild weather we have been having, many plants in their gardens were sending out a blossom or two. I just spotted a chive flower a few days ago. Thanks for sharing!